In 3 dimensional graphics, a computer can only render so many triangles before it suffers death by framerate. This is a problem in most games: the artists can never put as much detail into their 3D models as they would like. With games where you can see and walk to the horison and beyond, this is especially awful. How can a computer render every triangle on a terrain so many kilometers wide, and still get a decent framerate? The answer is fairly simple: it can’t. But the computer can reduce the number of triangles to be rendered on the graphics card. A distant mountain doesn’t need to have the same level of detail as the ground under the players feet, after all. This is the point of Level of Detail (LOD) Algorithms: render fewer triangles, but get a visual result very similar to what you would have had you rendered them all. There are many different styles of LOD Algorithm. Species uses a QuadTree. As the camera moves about the terrain, therefore, you can sink deeper into the quadtree and render high detail squares for nearby objects, and not sink anywhere near as far for distant objects, thus rendering them at a much lower detail. Of course, nothing is perfect. Two same sized quadnode meshes next to each other will fit seamlessly, but imagine a high detail node next to a low detail node. The result will be artifacts known as gaps. This can be fixed by ‘stitching’, where you either add or remove edge vertices from the nodes so that they match each other. In this case, I removed vertices from the higher detail node, creating a triangle pattern which connects to the lower detail node. In this screenshot, you can see it applied to every edge of every quadnode. In this one, it is applied correctly. It isn’t only distant objects need to be LODd. Nearby nodes which are not in view because you are looking in the opposite direction need not be rendered at all. By doing a collision test between the camera’s “Bounding Frustrum” (a 3d shape representing the cameras viewport) and a quadnodes bounding box, we can determine which nodes are outside the view and quickly cut a whole heap of geometry from the render. By combining this with the distance testing, we can stop that from sinking further into off-screen nodes as well! 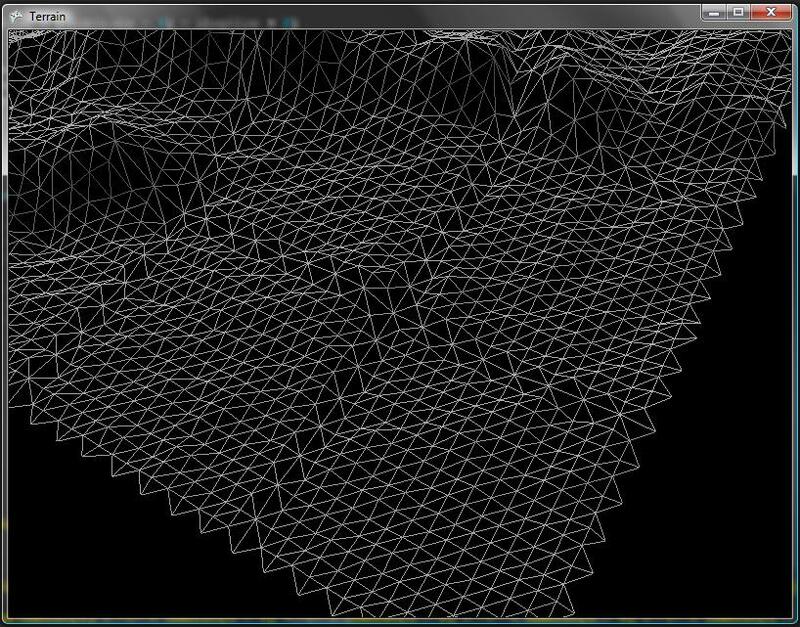 One of the things I spent a lot of time on was converting the terrain to run with more than one vertex buffer. The vertex buffer contains all the vertices read off of the heightmap. In general, it’s best to use a single buffer, because each buffer must be rendered with a separate Draw call. Unfortunately, there is a maximum limit to the number of vertices that can be rendered at once on the graphics card, and going above this limit will force the call to be rendered on the CPU (resulting in death by frame rate). This limit varies, but on my home computer over a million vertices (a 1024×1024 terrain) is just a bit too much. So, I implemented a nasty and complex algorithm to separate the terrain into a number of vertex buffers, based on the idea that each quadnode could be entirely contained within a parent vertex buffer if we split it correctly. 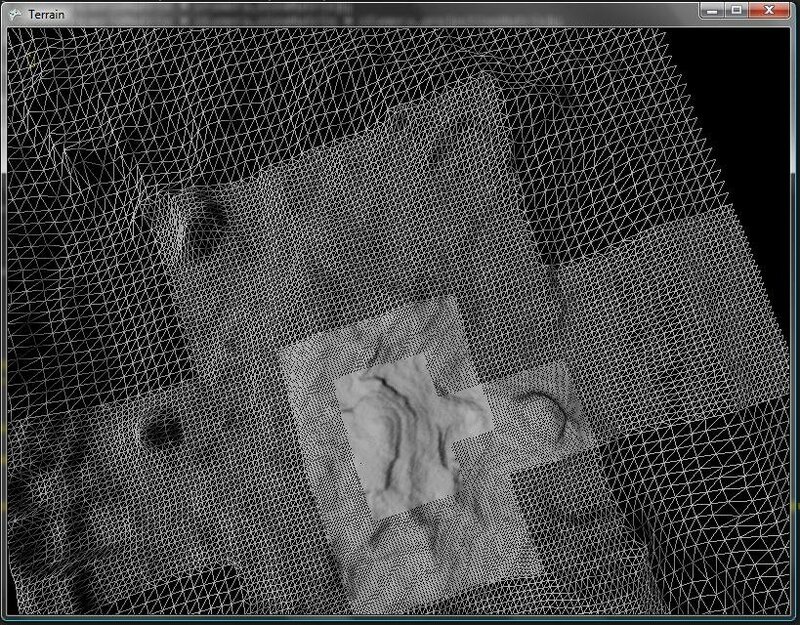 This (eventually) came out well: it is now possible to split your terrain based on a size value. 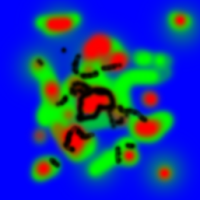 A 1024×1024 terrain split by 512 vertex buffers will come out as 4, 512×512 vertex buffers, with a fifth for all quadnodes which cover an area greater than 512 (only the root node, in this case). Dynamically changing the geometry can have a nasty effect: although the shape of a low detail node may be very similar to that of a high detail node, the shading can result in a fairly large difference in appearance if done per vertex. To solve this, I took advantage of the power of HLSL, and told the terrain shader to use a global normal texture rather than per vertex normals. The advantage was twofold: My vertex buffers halved in size, and more importantly shading no longer changes between high and low detail quadnodes. Initially, I didn’t understand the mathematics behind normal mapping, and thought that by simply adding a detail normal map value to my global value in the shader I could create detail normal mapping. The result looked OK, but it wasn’t accurate: the detail normal ‘pulled’ the global normal upwards. When I tested with a high strength value for the detail normal, this was instantly apparent: the entire terrain was shaded as if it was a lot flatter than it truly was. It wasn’t until after I’d finished the multitexturing that I worked out how to fix this, but when I did the difference was apparent (see below). Using a single texture for the entire terrain has two problems: the terrain is too big to be covered with a single texture with a high enough resolution, and tiling the same ground texture over the entire terrain is very bland. Therefore, I went for a multitexturing approach that made use of a blend texture. In short, mutitexturing is using more than one texture on the same object, and a blend texture uses it’s red, green and blue channels to define the amount of each texture to show. In the sample, Blue represents sand, Green – grass, Red – Foliage and Black displays as Rock. Quickly back on the subject of Detail Normal Mapping: you can see the difference between my original method, and my final method. “Overdraw” is a term used when the pixel shader renders a distant object, then renders a closer object which completely obscures the distant object. Obviously, rendering the distant object was unnecessary: it didn’t end up being drawn on the screen, and rendering it simply hurt the fill-rate. The GPU can overcome this if the near object is drawn first: when rendering the distant object, the fact that an object with a smaller Z-Buffer value has already been rendered will be detected, and the rendering process will be skipped. Therefore, it is to our advantage to render the near quadnode before the far ones. Since a list of Quadnodes to be drawn is built seconds before the quadnodes indices are compiled into the index buffer, it’s a relatively easy fix to add a sort function in between.